This rich, colorful, vibrant collection of art in the public sphere illustrates the spirit of the mural, as it takes its energy from the streets and the young voices of New York City. Now celebrating its fortieth anniversary, the grassroots organization CITYarts has fostered 260 flourishing public art projects in the five boroughs. Drawing in one hundred thousand young people and five hundred professional artists, this collective continues to channel kids' energy in constructive paths and promote the revitalization of communities along the way. This legacy is one of pure joy in tiny pieces, lovingly assembled by many small hands to create a whole greater than its parts. Murals' powerful, symbolic, and educational role in society was established as early as the time of the Lascaux cave paintings. In the '80s, New York graffiti artists residing in the East Village borrowed and built on the medium of the mural in their own work. Peter Sis and Keith Haring are two of those pioneering artists that supported CITYarts projects through their participation. 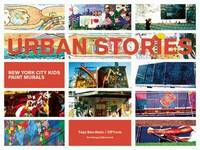 A terrific contribution to any interest in American public art or children's art, the book includes a street map that can be used as a walking guide to the murals pictured. Spanning many distinct themes and styles, each photograph is accompanied by essential information about the mural and its creators. The work also contains a selected reading list and bibliography about the history of murals, mosaics, and CITYarts' participating artists.